The Kia K Series, also known and the Bongo or Pregio is a lightweight commercial vehicle launched for the first time in 1980. Since then it was continuously improved and upgraded and now is offered with a choice of 2.5, 2.7 and 3.0 liter diesel engines which deliver maximum outputs between 80-130 hp. 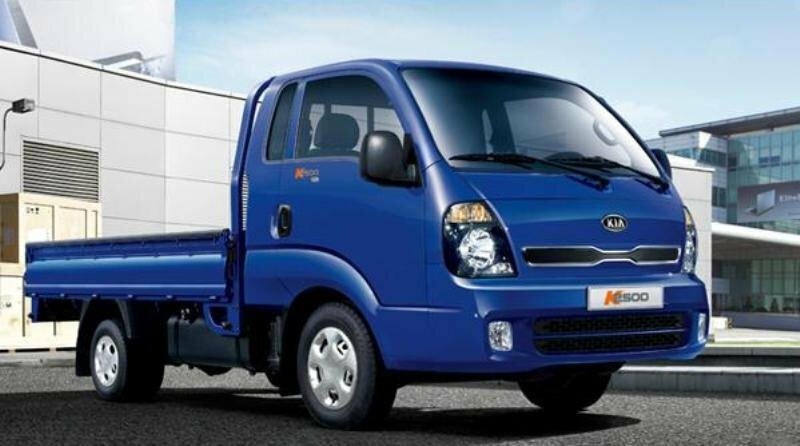 The Kia K Series is available with single, extended and crew cab configurations. 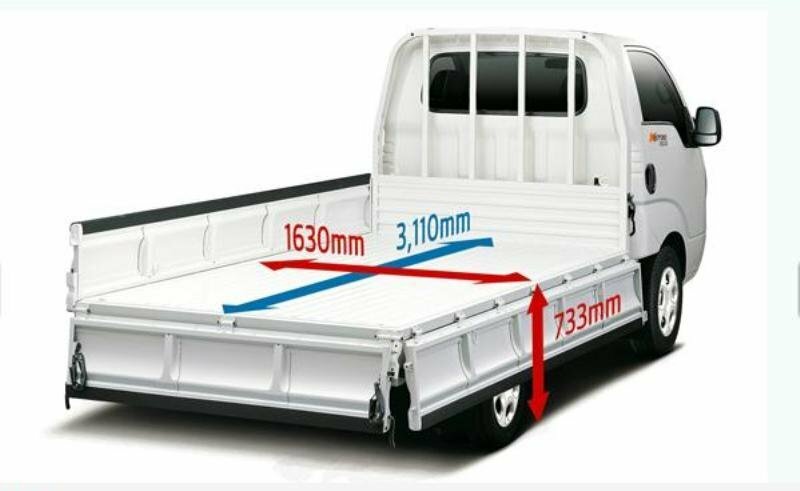 The cargo area has a length of up to 3.1 meters and 1.6 meters width, while the maximum payload capacity can go up to 1500 kg with a towing capacity of 1400 kg. The Kia K series features an unconventional design with a curved front fascia which improves the truck’s aerodynamics and keeps the fuel consumption to a low level. The bonnet is fitted with a thin modern grille that features the latest Kia design language. The big windshield follows the same raked line as the bonnet and is fitted with two wipers which come with integrated washers. The vertical light clusters are covered with polycarbonate lenses which are more resistant to impact than the conventional units. There are also big rectangular lights available, which cope well with the utilitarian nature of the truck and are integrated into the front bumper. The polyurethane bumper is pretty flexible and can absorb shocks without braking after the first impact. For enhanced ventilation, the bumper is fitted with a big air intake which. 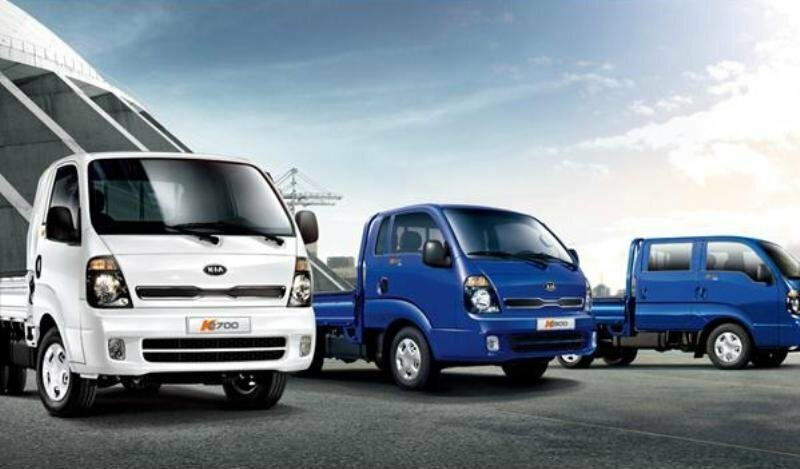 Compared to its main competitor – the Toyota Dyna – the Kia K-series is 430 mm longer, 45 mm wider, and has a 70 mm longer wheelbase hence offering more versatility. For a commercial vehicle the cabin is fairly spacious and surprisingly comfortable. The dashboard design isn’t something to rave about, but we like its fluid lines as they give the interior a modern feel. The plastics however, aren’t at the same level with Dyna’s materials, while the fit and finish is also inferior to its competitor. On the other hand, all the controls are within easy reach and have a logical layout that is easy to leave with. We especially like the vertical emplacement of the HVAC controls which can’t be seen at many vehicles in the segment and are fairly easy to maneuver. The instrument cluster is also nicely organized and the gauges are lighted by LEDs which makes them easy to read. 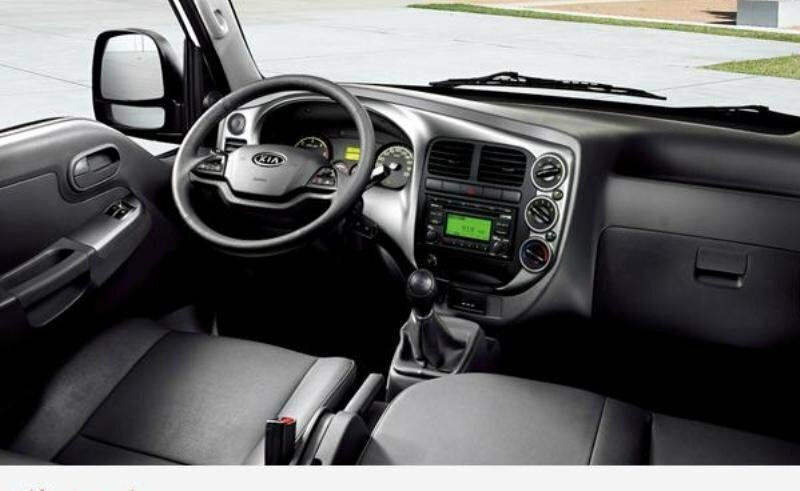 The Kia K Series single cab can accommodate up to three people, while the crew cab version offers seats for up to six people. The middle front seat can be folded down to form a handy tray with a storage facility and two cup holders, while the rear seats of the crew cab also fold down to provide a second row cargo area. The driver’s seat is fairly comfortable and comes with extra thick cushions in the seat back and bottom, as well as adjustable lumbar support. Moreover, the seats also slide and feature 3-step headrests for enhanced comfort. We also like the ergonomically designed, tilt adjustable steering wheel which is fitted with a bunch of controls for the audio system and mobile phone. The driving position is pretty high and thanks to the generous windshield and the big lateral windows, you have a good all-round visibility. The door mirrors are also up to the task and they are fitted with two separate convex lenses (for both short and long angles) which offer a good side visibility. We don’t have any complains about the storage places either, as there is a big glove box mounted in front of the right passenger, door pockets, a convenient storage dent into the dash and a small cubby hole that can be mounted under the audio system. There are three engine options available for the Kia K Series with 2.5 l, 2.7 l and 3.0 l displacements. The 2,476 cc intercooled turbocharged engine develops 130 hp with 255 Nm of torque achieved between 1,500-3,500 rpm. This engine is the strongest unit in the K series lineup and can deal pretty easy with any payload, being able to hit a maximum speed of up to 127 km/h. The 2,665 cc engine is a normally aspirated unit which offers a maximum output of 80 hp @ 4,000 rpm and 165 Nm of torque at 2,400. The engine is a bit sluggish compared with its stronger counterpart and it doesn’t like to be revved hard. On the other hand, is pretty quiet and offers adequate fuel efficiency. The 2,956 cc unit develops 85 hp @ 4,000 rpm and 181 Nm of torque at 2,200 rpm offering a good balance between power and efficiency. The engines can be mated to either 5- or 6-speed manual transmissions which are pretty smooth and offer satisfactory performances being able to deal good with the utilitarian character of the vehicle. The Kia K Series suspensions feature double wishbone with torsion beam at the front and leaf springs at the back. The suspensions are pretty well configured and cope well with the heavy payloads and also keep the ride’s comfort to a satisfactory level. The vehicle’s body roll is a bit big for our tastes and the gas shock absorbers will find it hard to offer a good balance when you attack a tight corner. 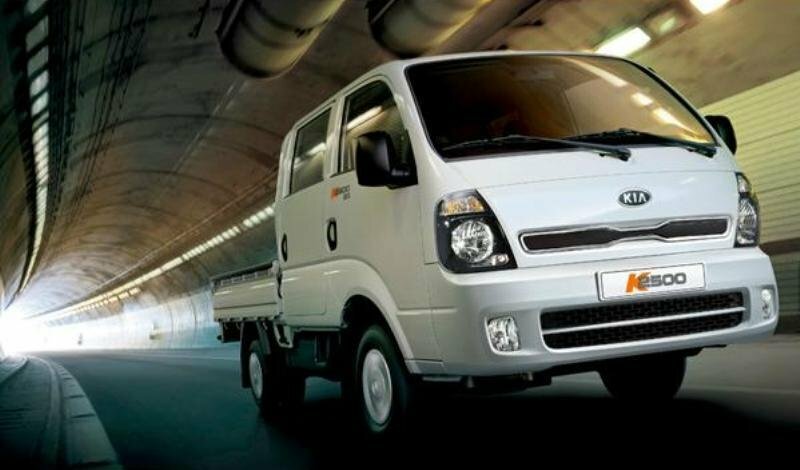 The Kia K Series can carry loads of up to 3.3 tones and is equipped with a capable power steering which is combined with a relatively small turning radius of 4.93 meters. The steering is light at low speeds and it gains some weight at higher speeds to assure a safe handling of the vehicle. The stopping power is assured by 4 sensor ABS brakes with EBD and for an enhanced safety the vehicle is also available with a driver air bag. The Kia 2700 is one of the most affordable vehicles in its segment. The truck has an aerodynamic design and is equipped with efficient engines which are able to cope well with generous payloads. The interior isn’t the best in the segment, but features a good overall ergonomy and is also pretty spacious. The ride and handling are at par with the competition, while the costs of maintenance and ownership are pretty small compared to the other vehicles in the segment.